The Annals of the University of Craiova - Mathematics and Computer Science series - publishes original research papers in any branch of Mathematics and Computer Science. Its policy is to feature a wide variety of research areas and it welcomes the submission of papers from all parts of the world. The journal is indexed and reviewed by Mathematical Reviews and Zentralblatt MATH. 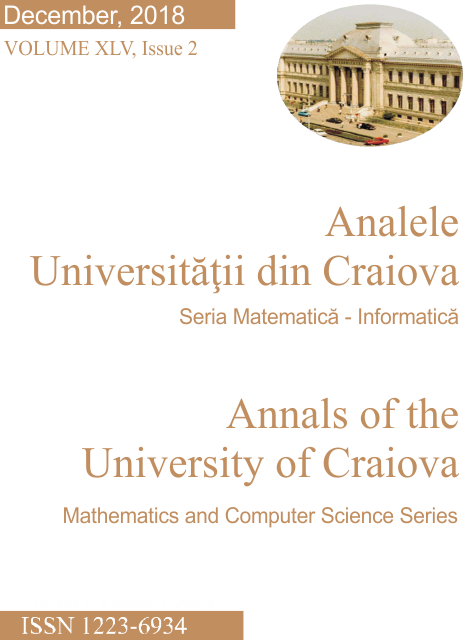 Annals of the University of Craiova - Mathematics and Computer Science Series is abstracted/indexed in: SCOPUS, Emerging Sources Citation Index (ESCI) - Web of Science Collection, Index Copernicus,MathSciNet, Directory of Open Access Journals (DOAJ),Open J-Gate, Genamics JournalSeek. This journal is also included in many digital directories of open resources in mathematics and computer science as AMS Digital Mathematics Registry, Central European University - Catalogue. In 2012, starting with volume 39, the „Annals of the University of Craiova - Mathematics and Computer Science Series" journal will have 2 issues per year (in June and December) and it is being monitored by Thomson ISI.